Canadian landowner Jessica Ernst, who is suing the giant frack company Encana and the Alberta, Canada provincial government for polluting her groundwater well with methane and other chemicals, goes to court today. Ernst’s website is here. Jessica Ernst, courtesy of Jessica Ernst. As investigative reporter Andrew Nikiforuk writes yesterday in The Tyee, Ernst is facing an unusual argument by the Alberta government: that it has no duty of care to people or groundwater. Jessica Ernst came to Michigan last May as a featured speaker at Ban Michigan Fracking’s public event “The Truth and Consequences of Fracking.” She warned Michiganders what to expect from the frack industry and in particular from Encana and that laws and regulations do not protect us from the dangers of horizontal hydraulic fracturing. Encana is drilling and fracking in Michigan. Horizontal deep frack wells have been permitted to Encana in the state forests located in Cheboygan, Missaukee, and Kalkaska counties and a new well now has been permitted to Encana in the state forest in Roscommon County. More to come on Encana’s wells in Michigan in future posts on our site. We stand with Jessica Ernst as she faces Encana and the Alberta government in court today. Her courage to seek truth and justice, and demand accountability from the gas industry and the government, is an inspiration to people worldwide. We, in Michigan, appreciate her sincerity and kindness in spreading the word about the dangers of fracking and making the trip here to meet with us. Please help spread the word of the dangers of fracking and Jessica Ernst’s story by sharing it with others. 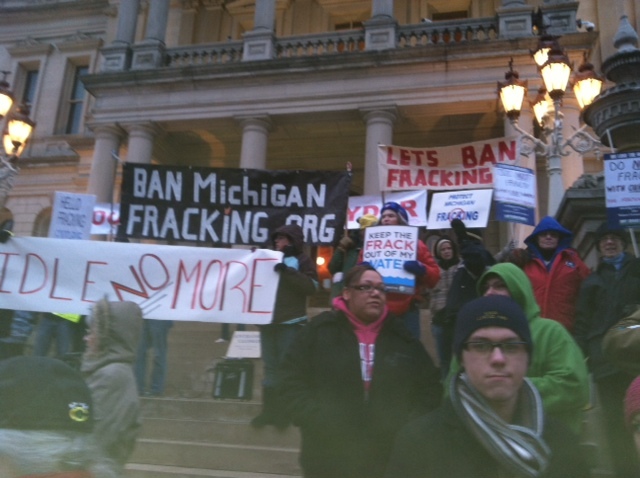 Here’s some coverage of the Ban Michigan Fracking rally outside the capitol yesterday before the governor’s State of the State address. People concerned about fracking and seeking to ban it shared the capitol steps with Idle No More and labor groups. The Detroit Free Press: Environmentalists, Indians, labor groups protest state of the state under Snyder, January 17, 2012. LANSING — American Indians, environmentalists and labor union activists stood together on the Capitol steps tonight to protest the state of the state under Gov. Rick Snyder. By 5:30 p.m., hundreds of protesters had gathered outside the Capitol in anticipation of Snyder’s State of the State address. Hartsoe said environmentalists from all over Michigan came to protest the policies of Snyder and the Republican-controlled Legislature, which she says will bring economic gain at the expense of the environment. CHARLEVOIX, MICH. — Michigan grassroots environmental group Ban Michigan Fracking learned through documents obtained from the State through the Freedom of Information Act that a frack flowback spill in May 2012 in northern Michigan was much worse than the Michigan Department of Environmental Quality first indicated. Documents and emails originally obtained last fall showed the state agency permitted spraying of flowback on roads early last summer for 30 days. The total was over 40,000 gallons. 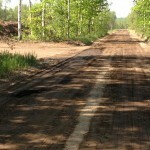 Newly-released documents now show the frack wastes were sprayed in a state forest between two horizontal frack wells in Kalkaska County. 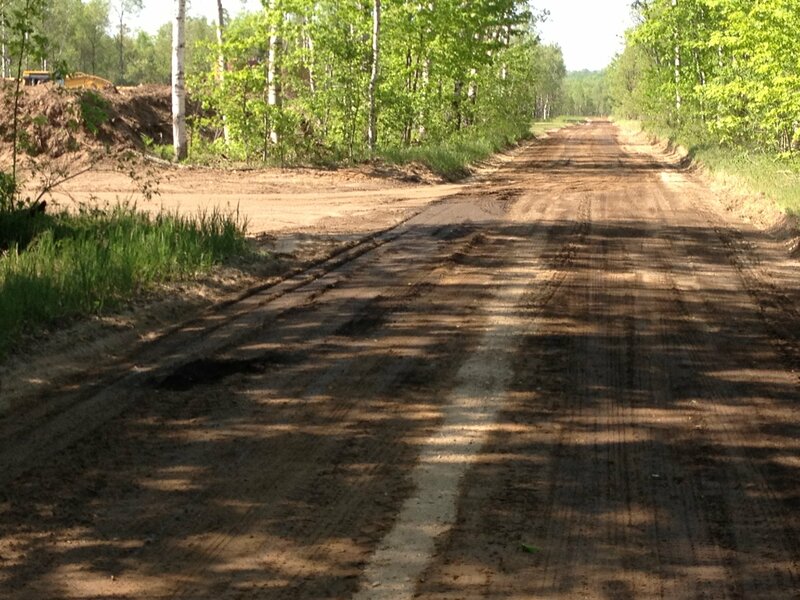 In Cheboygan County flowback was spread on roads abutting Paradise Lake, on camp roads at Mill Creek Campground, and in an industrial yard. They also show the spraying was permitted for 94 days, not just 30. Brady contacted the DEQ to complain. He then notified Ban Michigan Fracking. Meanwhile frack activist JoAnne Beemon contacted the DEQ in September. Senior geologist Ray Vugrinovich sent her a list of approved “brine” wells. It showed spreading of frack wastes from one horizontal frack well, “State Excelsior 1-25,” was permitted from May 14 to June 13. 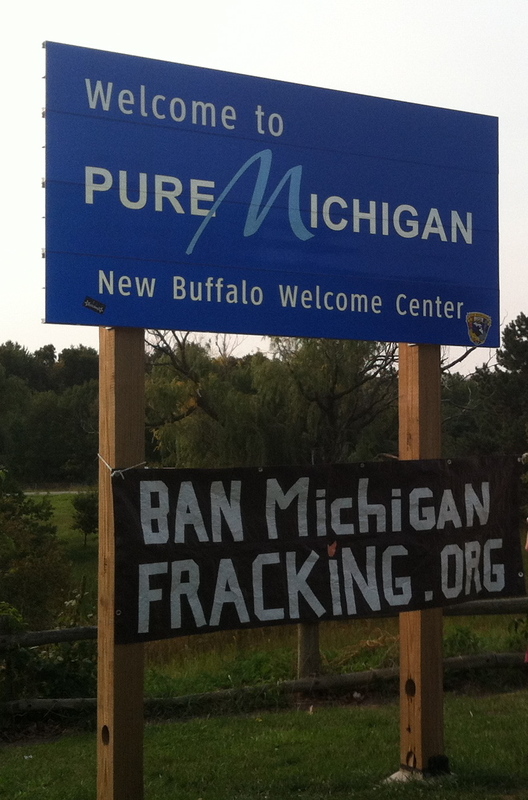 Ban Michigan Fracking (BMF), asked Vugrinovich for more information. The DEQ provided two letters, indicating approval to Team Services, a subcontractor to Encana, to use “brine” from the frack well for dust and ice control on roads. On June 13 the approval was revoked effective “immediately,” with dire warnings about unknown chemicals in the flowback. DEQ field operations chief Rick Henderson stated in an email that 954 barrels of flowback had been spread from two wells for 15 days starting on May 30. Noting the size and scale of the frack flowback surface release, BMF also filed reports of the incident as a hazardous spill to the National Response Center and with the U.S. Environmental Protection Agency. The EPA, which depends on Michigan DEQ for enforcing compliance, has not responded. The Michigan DEQ website claims “fracturing has never jeopardized the environment or public health.” The DEQ’s Henderson told the Traverse City-based Northern Express the DEQ had tested samples and found no threats. On receipt of BMF’s FOIA request, DEQ insisted on payment of $475.94. Pooling resources and under protest, BMF and other groups came up with it. A package of 372 pages finally arrived December 6. There was no cover letter. * The DEQ’s Vugrinovich had also granted permission on March 12 for a second well, “State Excelsior 1-13,” for spraying frack wastes on roads – permission that stayed in effect for 94 days to June 14. * Flowback was spread on camp roads at Mill Creek Campground on June 13, at the start of the high tourist season. The total was 2,268 gallons. The campground, now in its 50th year, is three miles from the Mackinac Bridge. It has 600 sites and a mile of Lake Huron shoreline. * Flowback was spread June 6 on Sommers and Paradise Lake Roads, which abut Paradise Lake in Cheboygan County, a total of 6720 gallons. * Flowback, 9240 gallons, was spread May 30 in the Michigan Wood Carriers yard in Wolverine. * Sunset Trail received 21,840 gallons on unknown dates. * The DEQ is not equipped to test for radium. It had to send spill samples to an outside lab for radium testing. * Results of testing, clean-up, and remediation, including the radium. * Documents showing the reasons DEQ allowed spread of flowback in public places, and what new information caused it to change its mind. * The identity of the secret ingredient in AI-2. DEQ regulations require materials to be specified after a spill or release regardless of confidentiality. * Superior Well Services supplied the AI-2 Material Safety Data (MSD) sheet and most of the others. * Kroff Chemical Company supplied one MSD sheet. * Fibertec Environmental Services analyzed the frack flowback for Encana. * Team Services spread the frack flowback for Encana. A June 14 email from the company’s Kreg Wyskochil is the source of the above dates, quantities, and locations of the flowback spread. Team Services, a Kalkaska, Michigan based company, owns five class-II injection wells in Michigan, provides fracking services, well site construction, brine spreading, and other oil and natural gas industry operations. Kreg Wyskochil has not responded to BMF requests for locations of frack flowback spread during the secret period from March to May. The DEQ is an environmental agency. It had a legal duty to notify neighbors as soon as it realized the danger. Team Services and Encana are private companies. Their duty to notify was moral. Mill Creek Campground, Paradise Lake Association, and the Cheboygan County Road Commission have been notified. (BMF was unable to reach Michigan Wood Carriers.) None was aware of the spills until last week. “Frack ‘brine,’ frack fluid, flowback, and ‘produced water’ are just different sides of the same frack-waste coin. The size and scale of this poisonous invasion of toxic industrial wastes from the thousands of horizontal frack wells planned for Michigan cannot be avoided unless there is a statewide ban,” said LuAnne Kozma of Ban Michigan Fracking. 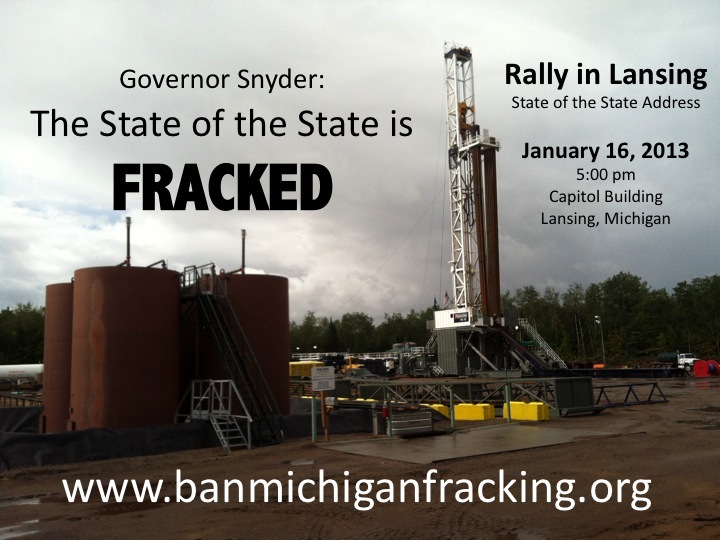 Ban Michigan Fracking will bring its message to the governor’s State of the State Address, January 16, at 5:00 pm, on the Capitol steps in Lansing. Ban Michigan Fracking is organizing a rally for everyone who wants to show the world that we want to BAN fracking in our beautiful state. Come to Lansing this Wednesday, January 16, outside the Capitol as the governor gives his State of the State address. Begin gathering at 5:00 p.m. We will be there until the end of the address (which starts at 7). 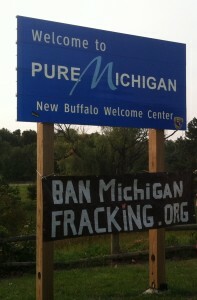 Look for the Ban Michigan Fracking banner. To accept regulated fracking is to accept the entire frack industry–all of it. All the thousands of frack wells, all the pipelines, all the compressor stations, all the thousands of injection wells, all of the new natural gas plants. And with it, you accept all the contaminations, the people and businesses who will lose their precious water supplies, their health, their land, their land values, their crops and livestock. Fracking, even regulated, will transform the state into an industrialized, polluted wasteland. And we all will pay the price. Help raise awareness of the serious threat to our state from fracking and join us. Come with creative, handmade, pro-ban signs.